trekking to the mountains requires not only physical strength but also survival skills, weather adaptation. Hot sun, drought or even rain, even flash floods are things that can happen when you are in the forest. Before you go, you need to prepare both for supplies, food and handling. Especially when it is rain, waterproof containers, changing campsites, large winds, dry food or cooking utensils in tents. One of the two immutable principles of imperialist Hoang Le Giang who has conquered the Arctic is that there is always a backup plan, even 2-3 alternatives for hypothetical situations. At present there are many leaders who lead the group, but not everyone is really proficient and experienced hills as well as handling situations arise. Unlike the regular group, a group that goes trek into the jungle needs physical strength and skill, under the guidance and organization of experienced team leaders. Ngô Huy Hòa, a mountain trekker in the north from trekkingvietnam, says he always hires locals, who live in the foothills to guide the porters because they understand the forest more than anyone else. Once he went to Pha Luang halfway to heavy rain, he resolved to turn back although the other members wanted to go. When he climbed Lao Cai, Lao Cai was hit by the wind, porter A H’u brushed the wind of the Hmong way, fed forest roots to resuscitate. Always ask the local people to lead the way when going to mountainous areas is the immutable principle of many players. Photo: Ngo Huy Hoa. Nguyen, in the city of Ho Chi Minh City, has dozens of trekking Ta Nang – Phan Dung (Lam Dong – Binh Thuan) said Yavly waterfall is only 400 meters above sea level, Always flooded when the rain. Even when Phan Dung does not rain, only rain on Ta Nang, the waterfall is still large, flowing. If water is strong, do not try to pass, because the water is falling very quickly and very dangerous (within a few minutes from the ankle up to the belly). Prepare a tight rope to keep the group clinging to each other when crossing the stream. Absolutely not to climb the creek or waterfall falls in the wilderness. The groups often go from Ta Nang down, cross two streams to the top of the waterfall, then round the foot of the waterfall to bathe and take pictures. Although the dry season this area is not easy, especially for the first time, because there are many smooth slabs, concave, lying in the water. Moreover, the wearer often wears heavy balo on the shoulder, if the foot slide loss of balance, difficult to handle. The small water in Phan Dung becomes a torrent of water in the rainy season. Video: Quang Tran. 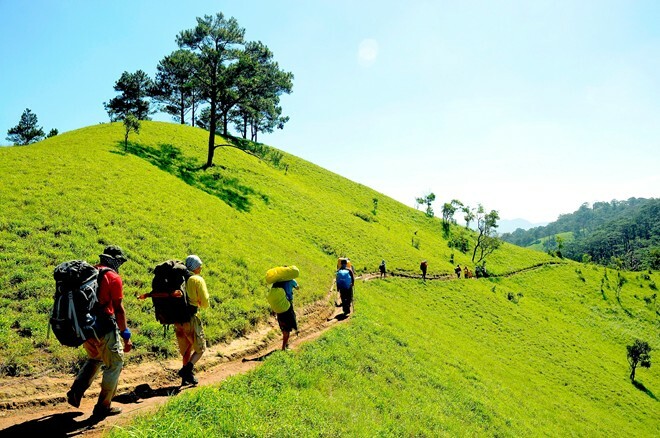 If you are not experienced, you can choose another route without dropping or skipping the rainy season trek. 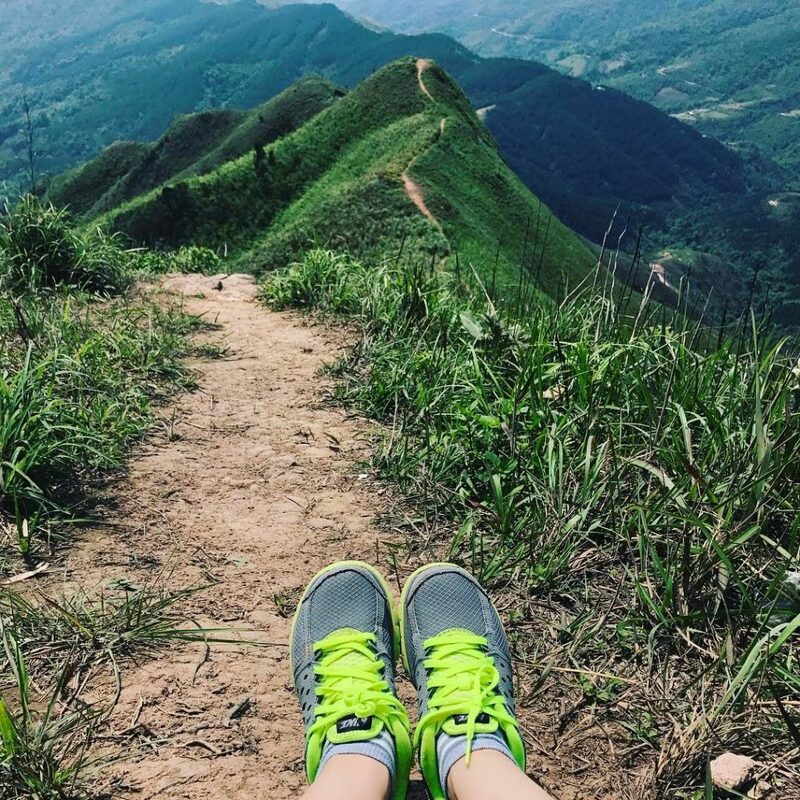 According to him, the dry season is a new climbing season, no loss of strength, stable weather and easy to see the beautiful scenery. All members of the delegation know the schedule, the land to go. Team leaders need to inform the team to save offline map, use the compass determine direction, prevent stray, group separation. If the member is unclear about the way his or her going, then when stray or fall behind will also have psychological panic, fear. Self-care to have enough health, sleep, self-injury is the principle of immortal when trekking. Do not depend on others, on the collective. Quang Tran (27 years old, Ninh Thuan) trek many mountains in the south share, he always has a ball full of food and equipment but not too cumbersome. If strayed, have to stay in the forest longer, dry food, you can live with wild vegetables, stream fish but must have accurate knowledge of the animals and plants in the area.